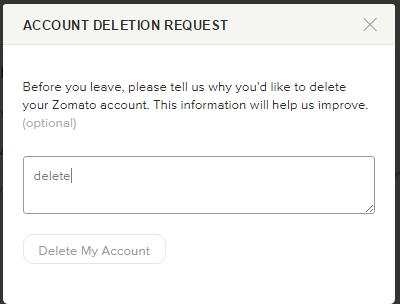 How i deleted your zomato account ! Zomato is an online restaurant search and discovery service providing information on home delivery, dining-out, cafés and nightlife for various cities of India and 21 other countries. It has 62.5 million registered users. Now to delete the account you have to type delete inside it and confirm! but there was a flaw there was no csrf token available to validate the request!. What is CSRF TOKEN ? CSRF token is a protective measure used to prevent cross site request forgery attacks which checks that the request is coming from the legitimate user or not ! save this as delete.html and send this to your friend! [+] Bug Fixed by team .